As expected, the public flocked to BCA’s Good Friday Sales at Blackbushe and though many were merely spectating, some of those prepared to commit to bidding drove home in bargain cars. 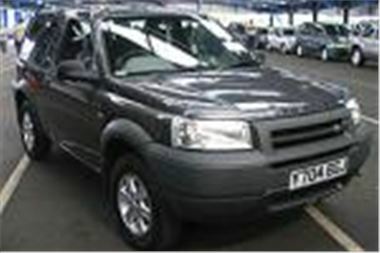 The Freelander in the photo was a 69k mile TD4 hardback with alloys and a/c and sold for £8,900 which is the cheapest I’ve yet seen for one with the BMW diesel engine. A pair of other BMW diesel engined Rovers, these two 75s sold at £6,250 for the 73k mile 2000W and £6,100 for the 59k mile 99T. There were all ages of BMWs for fans of the marque. A 116k mile 96P 328i Touring bid to £3,450; a 100k mile 2000W 316iSE bid to £6,000; an 88k mile 2000W 320D SE bid to £8,300; a 99k mile 2001Y 525dSE with leather bid to £10,200; and a late entry 51k mile 02 reg 320D 150bhp SE started low at £11,000 then went on to sell for £13,700. An ex taxi rank 03 reg Skoda Superb TDI PD 100 Comfort with 35k unwarranted made £9,250. There were an abundance of oddballs. A 14k mile 2002/52 Hyundai 2.7 V6 coupe with a noisy hydraulic tappet bid to £12,000; a 54k mile 2000X Trajet 7-seater automatic bid to £5,925, while a rust-free 55k mile 2000V Sonata 2.5V6 looked a lot of car for just £3,400. A pair of 6 cylinder Jag XJs made £5,500 for the 87k mile 96P 4.0 Sovereign (which had some fresh paint) and £3,900 for the 99k 95N 3.2 auto. Sensible buy of the day was probably a 9k mile 2002/52 facelift Focus 1.6LX 5-dr with a/c and alloys, sold for £6,400. Next Top Car Auction at Blackbushe will be on Easter Monday, 12th April. Then on 15th April there will be a big Ford ex-rental sale.